Disney Junior "Jake and the Never Land Pirates" Mama Hook! | Focused on the Magic : Disney Junior "Jake and the Never Land Pirates" Mama Hook! Disney Junior "Jake and the Never Land Pirates" Mama Hook! Here's a Disney Junior treat for you! Mama Hook is back! 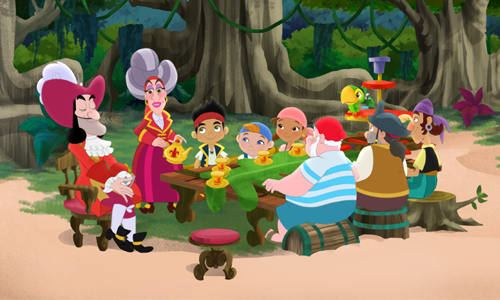 In the episode titled "Where's Mama Hook?/Captain Hook's New Hobby,"
Hook and Jake join forces to find Mama Hook when she goes missing in Never Land. And then Mama Hook suggests her son find a hobby so everyone pitches in to help the cranky captain find the perfect pastime. Sharon Osbourne guest stars as Mama Hook. Mama Hook is back! In the episode titled "Where's Mama Hook?/Captain Hook's New Hobby," Hook and Jake join forces to find Mama Hook when she goes missing in Never Land. And then Mama Hook suggests her son find a hobby so everyone pitches in to help the cranky captain find the perfect pastime. Sharon Osbourne guest stars as Mama Hook.